Penned on March 15, 2009 . 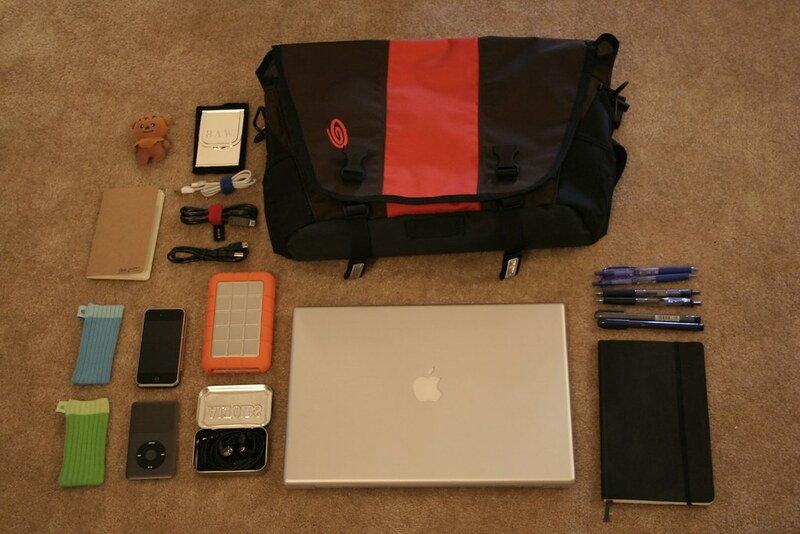 I carry a recently purchased medium Timbuk2 Commute stuffed with tech goodies. It's a great bag. Plenty of pockets, lots of protection in the laptop compartment and super durable so far (I'm not exactly gentle when it comes to bags). The strap isn't the most comfortable but it does have a quick adjust tab that makes putting on and taking off the bag a snap. My daily laptop is a mid-2008 MacBook Pro provided to me through work which gets swapped out for my own unibody MacBook Pro when I don't need to work. Along with that I've got a 250GB LaCie rugged portable hard-drive. It's not the most attractive drive out there, or the cheapest, but it's one of the few that have USB 2.0, Firewire 400 and Firewire 800 interfaces which is why I picked it. For entertainment I've got a 120GB iPod classic, an original iPhone with iPod socks for cases and a pair of Shure SE530 headphones lovingly stored in a cleaned out Altoids case. Not pictured is my work-issued Blackberry 8700 (because really, why would I want to show it off?). And to cap it all off, my assorted low-tech belongings include softcover medium gridded and small unlined Moleskine notebooks, a handful of Uniball Signo and Zebra brush pens, a business card case and a stuffed Wicket for good luck.